Taking party inspiration from Ezra Miller at the premiere of Fantastic Beasts: The Crimes of Grindelwald is likely to divide the crowd. But Miller’s choice of a feathery feast from Givenchy’s autumn/winter womenswear couture collection makes one thing clear: all preconceived ideas of menswear have gone out the window. Against the backdrop of ghastly global politics in which difference is not celebrated, fashion is pushing boundaries, with Gucci and Maison Margiela ditching traditional ideas of gendered clothing. For more glam ideas, see the Freddie Mercury biopic, Elton John for John Lewis and Dalton Harris on The X Factor in a sequin suit. On a budget, try Asos or River Island – better still, go vintage. Arguably the hottest red-carpet trend in menswear this year has been the white suit. It is a clever way to stand out as a man. Timothée Chalamet wore an off-white tux by Berluti to the Oscars and positively reeked of chic. For the London premiere of Bohemian Rhapsody, Rami Malek wore a white Berluti two-piece, finished off with a black shirt and black boots. 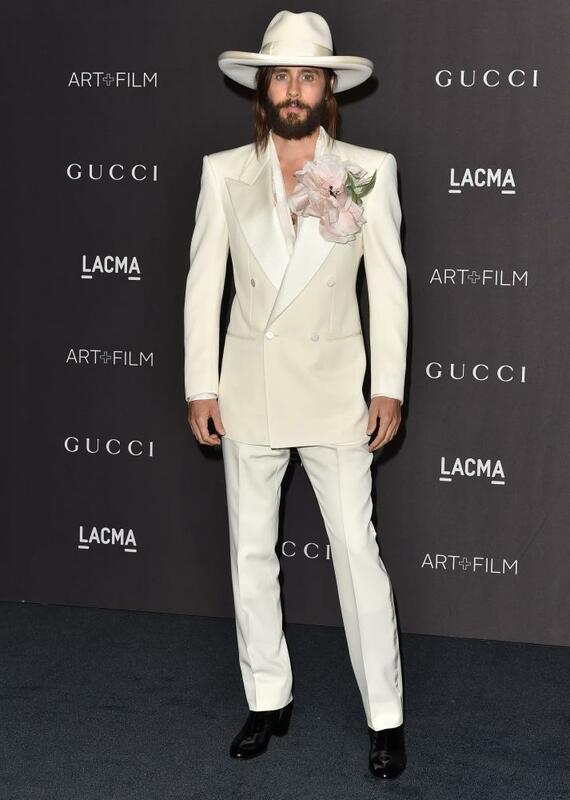 Jared Leto, in his continuing love-in with Gucci, appeared at a recent event in Los Angeles in a white tuxedo with a gargantuan floral corsage. As a look that demands a “clear drinks only” policy, it may have limited mileage IRL, but Zara – never shy of embracing a niche trend – has a white tux for your consideration. For a gentler nod, there is a white velvet bow tie at Reiss. Speaking of velvet, is it still a thing? Oh, it is. 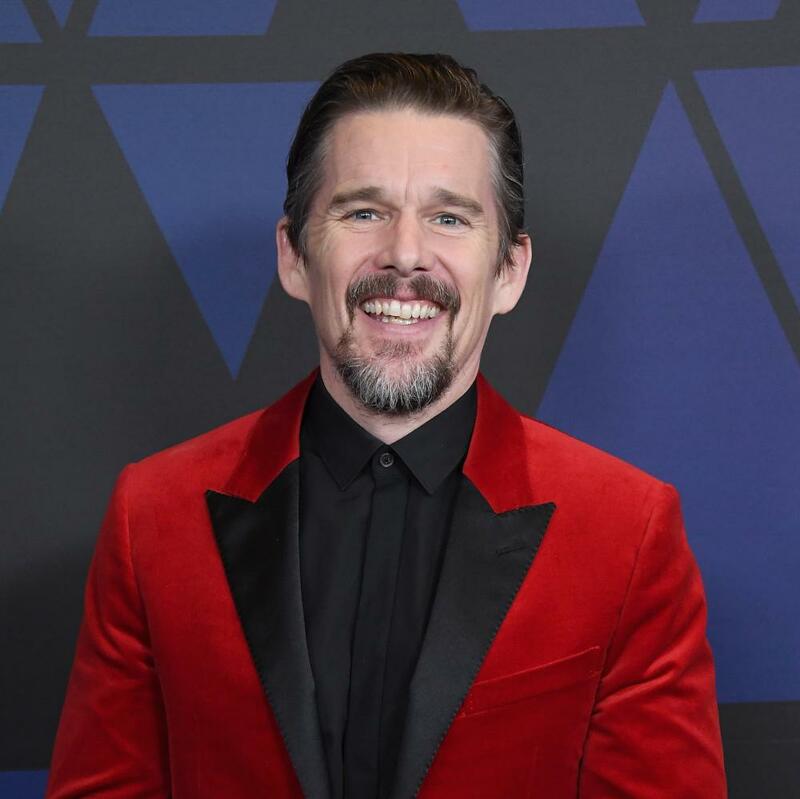 Ethan Hawke went red on the red carpet in a velvet Lanvin blazer with a black contrast lapel, proving that men over 40 can – and should – wear colour. On the high street, Zara – once again – is backing a mustardy yellow blazer; on the pricier spectrum, Reiss has one in teal. My pick this season is a “midnight brown” velvet pullover by Cos – not exactly a snip at £180, but it will work after Christmas. It is baffling that people still question whether or not you can wear jeans to parties – look at Andy Warhol in Levi’s, blazer, striped shirt and tie. If you don’t like fancy evening trousers, wear your favourite jeans and be done with it. This nods not only to the whole Warhol moment – see his collaboration with Calvin Klein, a show at the Whitney in New York and the November 2018 cover of Art in America magazine – but also to Ralph Lauren’s trademark tuxedo jacket and jeans. Although a lot of men get nervous when trussed up in dicky bow, in the right context black tie is dashing. See Andrew Garfield and Ralph Fiennes – who wore a dapper grey coat over his tux, showing how to keep warm and stay slick – at the recent Evening Standard theatre awards. (Of course, the all-time tuxedo pin-up is River Phoenix at the 1989 Oscars, in his majestic-haired glory.) This year, Claire Foy, Tilda Swinton and Cara Delevingne have adopted the look – very Yves Saint Laurent Le Smoking – further blurring gendered wardrobe lines. Note: M&S has tux jacket options for less than £70. If you don’t want to invest in a new look, or you simply want to ramp up an existing one, the cheapest route is often a great accessory. The game this season has been raised by A$AP Rocky, who turned up at Gucci’s bash at the Los Angeles County Museum of Art in November in slippers, sunglasses and a headscarf, with a satin robe over his suit. Yes, this is a lot of look – a pair of minimal boots or lace-ups would have been far more modern – but the headscarf raises an important point: party headgear. Can you wear a baseball cap, for example? If you would wear one on the street, why wouldn’t you do so on the dancefloor? 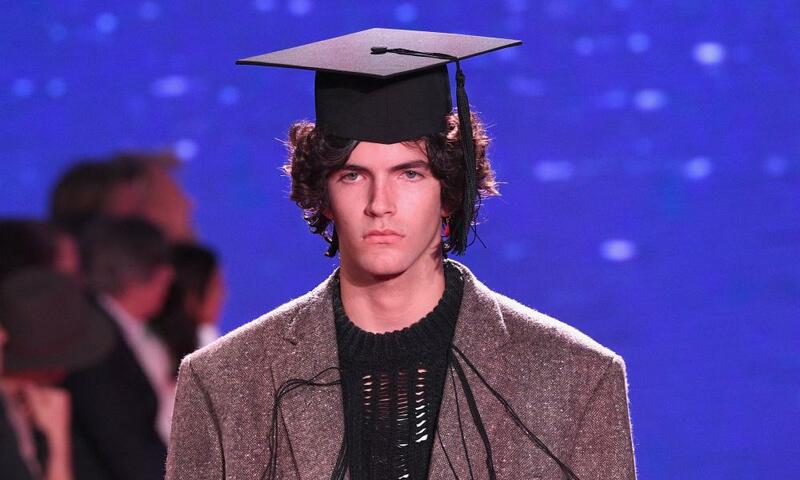 River Island is a one-stop shop for accessories the right side of “statement”, but for full directional party points, look to the mortarboard, as seen at Raf Simons’ spring/summer 2019 Calvin Klein show.